For any of the given market, cosmetic shop business has many new and established competitors. And your business has to combat them as the new cosmetics products are launched regularly. That’s why it’s an essential part of starting the business to make wisely a marketing strategy. There is an immense scope for growth, provided you proceed in a planned way if you’re planning to start this business. Also, it has clear statistics that show there are plenty of business opportunities in the cosmetic industry. The business is not only a great opportunity for unemployed people but a small cosmetic shop can start making profit shortly. This is the reason that attracts a lot of young people has started the business and most of them are successful. The business requires your commitment and confidence along with patience. 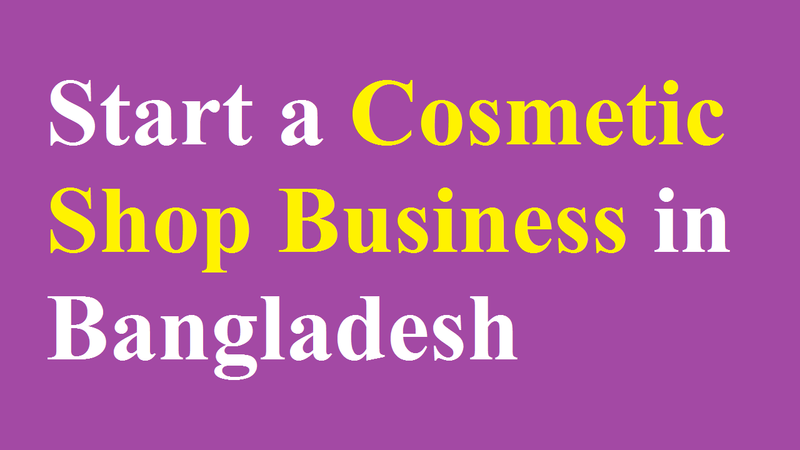 As there is a growing demand in Bangladesh, a cosmetic shop business has a great prospect. This is because there is ever increasing population who has the demand for all types of cosmetic products. With a population of over 160 million, Bangladesh is pretty enough to start this business. Also, the demand of new cosmetic products is growing as the awareness of people is increasing. That’s why there is a great demand for premium cosmetics is expanding everywhere including the middle class of developing countries. In addition, the competitions are still not so high in this industry. That means you’re more likely to be successful in this business. And it doesn’t require any specific academic degree, which is the most attractive part of the business. Although a cosmetic shop business is profitable, it’s not an easy feat to open a retail cosmetic shop business. If you want to survive in this business, you must have a wise marketing plan and some funds. In this case, you should get help and advice from your friends and family. Although the term ‘business plan’ sound intimidating, creating one is necessary for the success of your retail cosmetics store. If you want your business’s success, a good business plan is a blueprint for that. When you’ll make your business worth, you’ll find some investors, for example, banks, microfinance organizations, show invest in it. So, you need to break down the nitty-gritty details when you’ve done the fun stuff like naming your business. In order to figure out where your business fits in, you need to do some market research for cosmetic shop business. Apart from that, the business plan should illustrate your operational, management, employment and, marketing strategies. For a cosmetic shop business, a great location is imperative alike in other retail business. And you should identify a few potential locations for your business based on where your target demographic lives and shops during the development of your business plan. So, it might be ideal for a luxury retail cosmetics store to select a high-traffic strip mall in an upper-income area. But, as a discount retailer, a storefront in a busy lower-income area could work well. Also, you should decide whether you want to rent or buy a store during the planning stages. It depends on many factors which option is right for you. These include your location and the startup funds you have available. It’s an important step to starting a cosmetic shop business to decide what to sell in your store. If you want to serve your target demographic, you need to choose the products you sell carefully. You may not be able to carry every brand in your store because some popular cosmetics brands have exclusive deals with specific retailers. Moreover, there are minimum purchase orders that could make orders for some high-end brands. So, you’ll learn about their offerings and any rules on minimum orders if you research different cosmetics vendors. That’s why keep a good relation with chosen vendors and set up an inventory plan. Thinking about how you want to set up your systems for inventory, sales, marketing and more is a good idea. Also, it’s important to set your store policies where you’ll include those covering employee conduct and customer returns. In this case, you need not only a solid business plan but need the business tools you want to work with as well. Although it may look like a lot of think about it, it’s essential. This is because important to train employees properly and keep things running smoothly. As there is a business marketing plan while you have made the business plan, and it’s time to implement it. You need to let customers know who you are and what you’re offering when you’re ready to open your doors. It essentially important to get the word out and you can do it through advertisements, promotions, organic and paid social media such as Instagram and more. Moreover, if you want to be available on the web, you need a polished web presence featuring colorful, high-resolution photographs of your cosmetics products. Besides, you have to print your business cards and distribute them to spread out your cosmetic shop business. When you have made your business a big venture, you need to hire employees. It can make a huge difference in the success of your business while having reliable, hardworking employees. Also, before letting customers through the door you want to make sure employees feel comfortable with your products and systems. This is because the first impressions are important. In this case, you need not only time but you must train your employees well while hiring them.